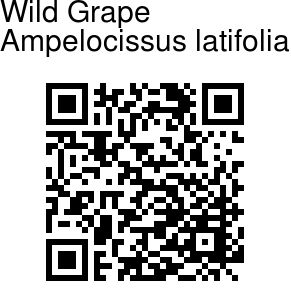 Wild Grape is a large herbaceous climber, with a tuberous root stock. Stem and branches are hollow, more or less smooth. Leaves circular or broadly heart-shaped 7-15 x 8-15 cm, 3-7 lobed, lobes acute, toothed. Leaf stalk 3-5 cm long. Inflorescence is a compact cyme with a stalk 6-7 cm long, ending in a long bifurcate tendril. Flowers numerous, deep reddish. Petals 5, oblong. Fruit is spherical, black, 6-7 mm, 2 seeded, rarely 3 seeded. Flowering: May-August. 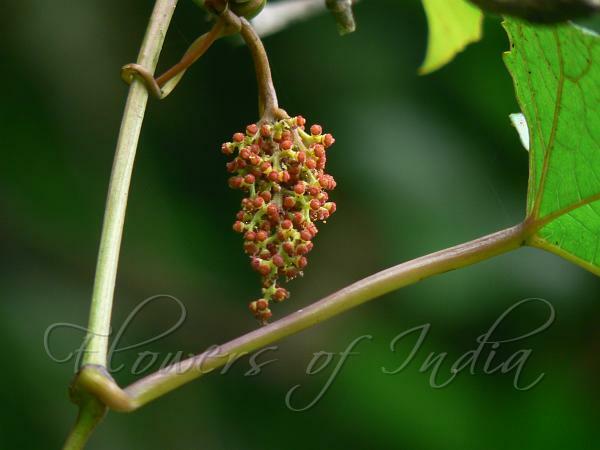 Photographed in Sanjay Gandhi National Park, Mumbai.